Forty-nine people have been shot dead and 48 injured in attacks targeting Muslims at two mosques during Friday prayers in Christchurch, in the worst mass shooting in New Zealand’s history. The prime minister, Jacinda Ardern, described the atrocity as a terrorist attack and said Friday had been “one of New Zealand’s darkest days”. Police commissioner Mike Bush said explosive devices in a car had been defused and urged all mosques across the country to close their doors for the time being. A man in his late 20s was arrested and charged with murder. He will appear in court on Saturday morning. Two other armed suspects were being held in custody. Police said they were trying to determine how they might be involved. Police have not named any of the suspects, but a man identifying himself as Brenton Tarrant, a 28-year-old born in Australia, broadcast livestream footage on Facebook showing him driving to a mosque, entering and shooting randomly at people inside. New Zealand’s entire police arsenal and personnel were deployed throughout the country and en masse in Christchurch, the South Island’s largest city, which is known to have an active white-supremacist subculture. Hotels in the inner city stationed security guards at their entrances, and armed police protected landmarks of significance, including the courthouse and Christchurch hospital, which is believed to have been a further target. 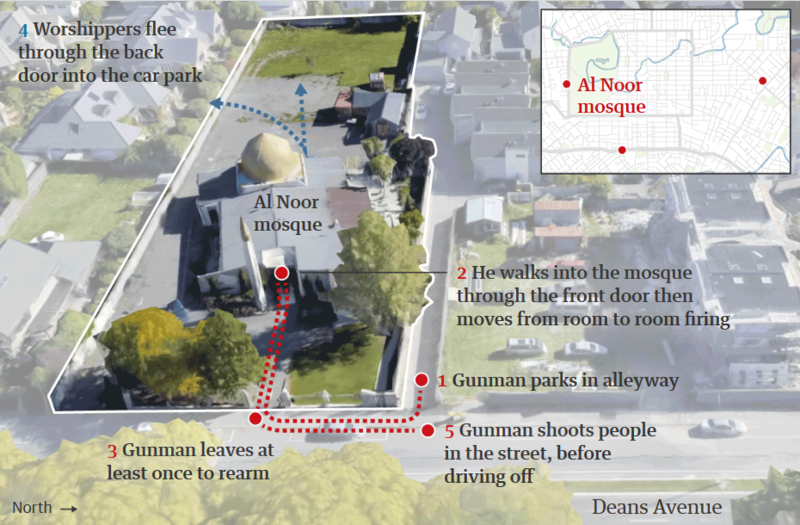 A Christchurch spokesperson told local media police were concerned the suspects had plans to target the victims of the mosque attack as they were transported to hospital. A “manifesto” was posted online before the attacks, in which the suspected gunman espoused far-right and anti-immigrant ideology.